355 in stock Need More ? 20 cm [xiii], 217 p. : ill. Previous ed. : London: Century Hutchinson, 1987. Internationally renowned author, Susan Jeffers, has helped millions of people around the globe to overcome their fears and heal the pain in their lives. Such fears may include: Public speaking; Asserting yourself; Making decisions; Intimacy; Changing jobs; Being alone; Ageing; Driving; Losing a loved one; and Ending a relationship. But whatever your anxieties, "Feel the Fear and Do it Anyway" will give you the insight and tools to vastly improve your ability to handle any given situation. You will learn to live your life the way you want - so you can move from a place of pain, paralysis and depression to one of power, energy and enthusiasm. 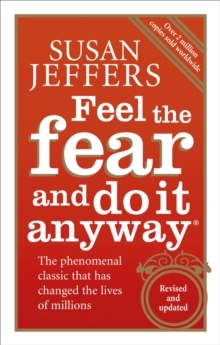 This inspiring modern classic has helped thousands turn their anger into love - and their indecision into action - with Susan Jeffers' simple but profound advice to 'feel the fear and do it anyway'.